Are you looking for a beautiful meal to make for your Valentine? 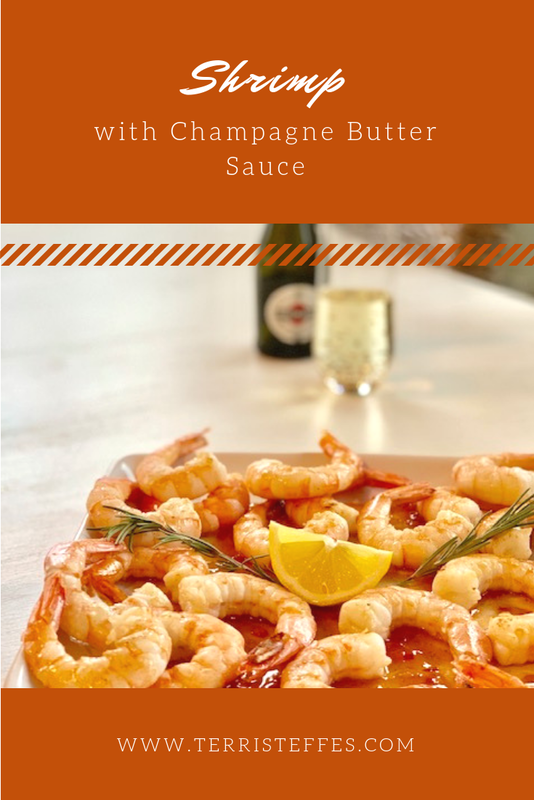 I am in love with Shrimp with Champagne Butter sauce! Doesn't it sound beautiful and romantic? I think it does! We are talking about big shrimp, the 16-20 per one pound bag. I like uncooked, that are cleaned for me. Yes, they cost more. However, I want to spend my time with my honey, not cooking. I'm joining a group of bloggers to give you a lot of options for a dining IN Valentine meal. My husband and I love to eat out but on Valentine's Day many restaurants have a pre-fixe meal (which we do not like) and they are overpriced and crowded. Dining IN is so much fun and is much slower paced and cheaper! Why Champagne Butter sauce? I thought that Valentine's Day deserved the extra special bubbly and the real butter. For this meal, make the ingredients the best you can afford. It will make a difference! An elegant meal perfect for special occasions and holidays! In a large skillet heat the olive oil. Pat shrimp dry with a paper towel (make sure they are not frozen!) and place into skillet cooking until shrimp turn pink. Remove from pan and continue until all shrimp are cooked. Cover to keep warm. In the same pan add champagne. Stir until browned bits are scraped from the bottom. Add one pat of butter and whisk until melted. Keep adding butter until all is incorporated into the champagne. Add minced onion. Add the juice of the half lemon. Cook for 5 minutes, reducing sauce to half. Plate shrimp and pour sauce on top. Thaw shrimp completely before cooking. Mince onion to a fine chop. You can serve the shrimp over a bed of rice or risotto, or my favorite, orzo. Serve these green beans on the side, and use the rest of the champagne for toasting! Be sure to visit these other delightful bloggers and their fun recipes! That looks absolutely amazing. Even though Valentines is over we did not have a chance to celebrate it. This would be a great meal for our own little valentines. This is the perfect Valentine's Day dinner! We avoid the crowds and always eat in. This sounds like a great dish to make for date night. oh my gosh STOP this looks so incredible- im not always a huge fan of butter sauce but adding it with a bit of champagne never hurt am i right ha- we usually try and stay in for valentintes day so i might want to do this next year! We do love our shrimp in all different ways. The sauce sounds so yummy. Something different to make and enjoy. 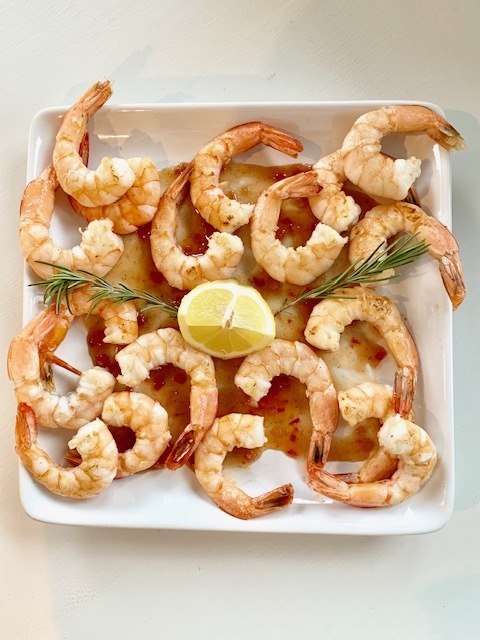 My son loves shrimp and we rarely cook it at home but this recipe sounds so good. I will have to make this for him when I shop for shrimp. Now this is the kind of dish I could really impress my family with. The sauce sounds super nice! I hope you had a lovely Valentine's Day! I got to spend it with my loved ones which was really nice. My husband and kids love shrimp, so I bet they'd love these. I might have to make the shrimp for them one evening. The butter sauce sounds incredible. My husband loves shrimp, however he's allergic. I do make it for my parents when they're here. Will look into this dish. I'm a pescatarian, so I eat a lot of shrimp. Champagne butter sounds delightful as well. Does it taste like shrimp scampi? That's what it reminds me of, but with champagne. Oh my goodness! I love eating shrimp, and actually, that is my favorites! It looks perfect food for us! Love this kind of recipe. My husband was just saying he wanted shrimp scampi recently. We will have to try this! We love shrimp over here. And since I still have champagne left from our anniversary, I am going to try this. Can't wait! It sounds absolutely amazing!!! So good! Oh gosh, I LOVE shrimp! I need to try this champagne butter sauce soon! My husband loves seafood and he's a fantastic cook. I'll be sharing this recipe with him. That sounds delicious! I am a huge fan of shrimp and this sounds like the perfect way to celebrate, well...anytime.